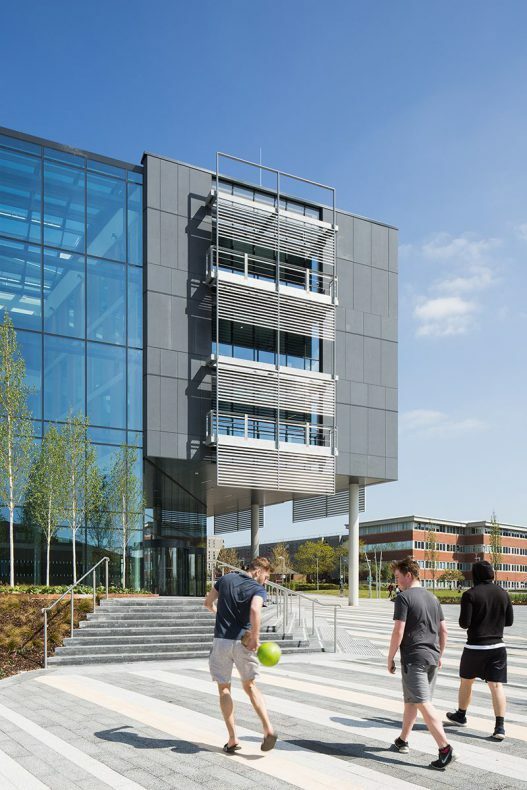 An iconic building for the University of the West of England (UWE Bristol). 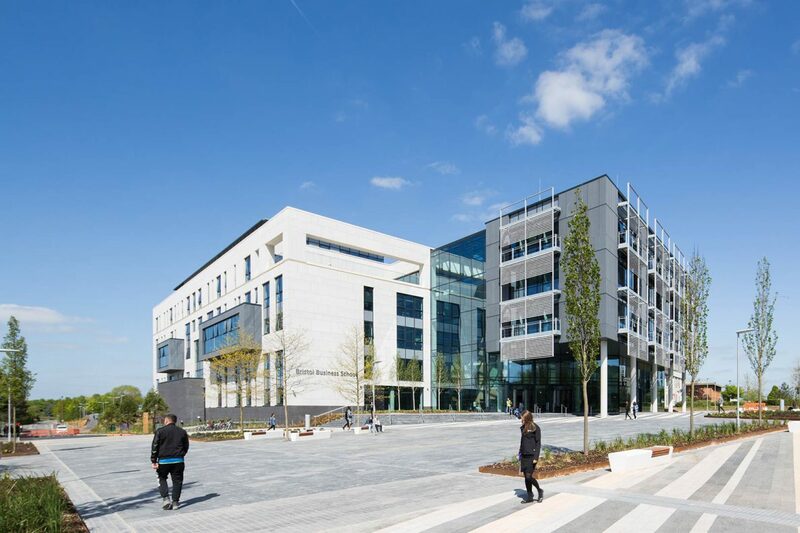 The £50m Bristol Business School for the University of the West of England (UWE Bristol), located in the proposed ‘Heart Zone’ of the Frenchay Campus masterplan, provides a new home for the Faculty of Business and Law. 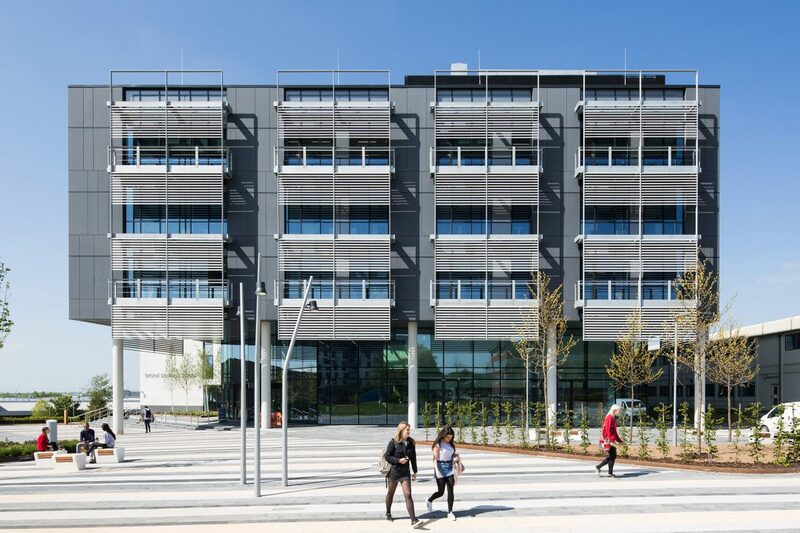 The 17,000sqm building forms the most significant building and external space at the campus and sets the scene for future developments. 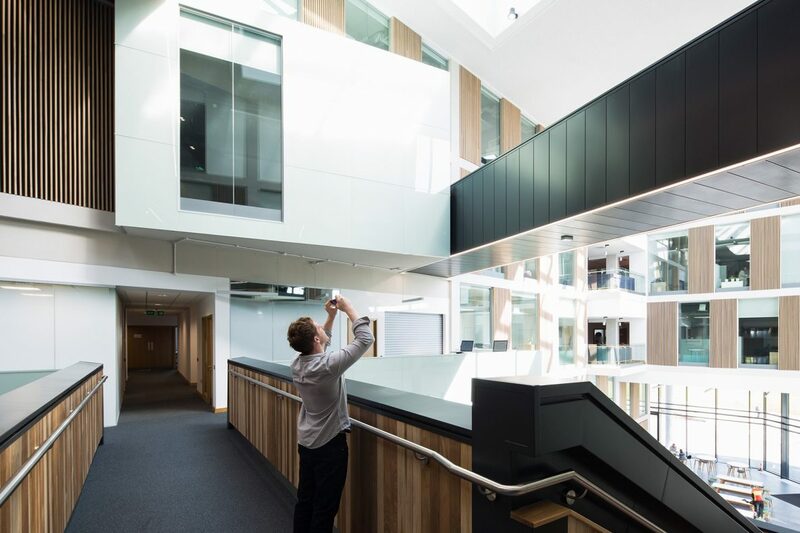 The aim was to create a facility that students and staff want to stay in before and after formal teaching sessions, encouraging greater interaction between the building users; students, staff and visitors. rooms furnished with collaborative group working furniture. 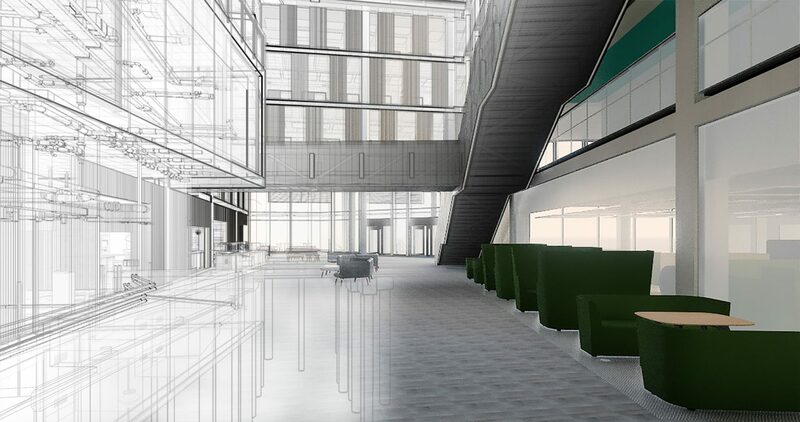 Café seating extends through the atrium area and users are encouraged to take their food or drink anywhere in the building that they feel comfortable inhabiting. The new south facing plaza, design by our landscape architecture team, is directly connected to the café facility allowing students to study outside the building under cover. 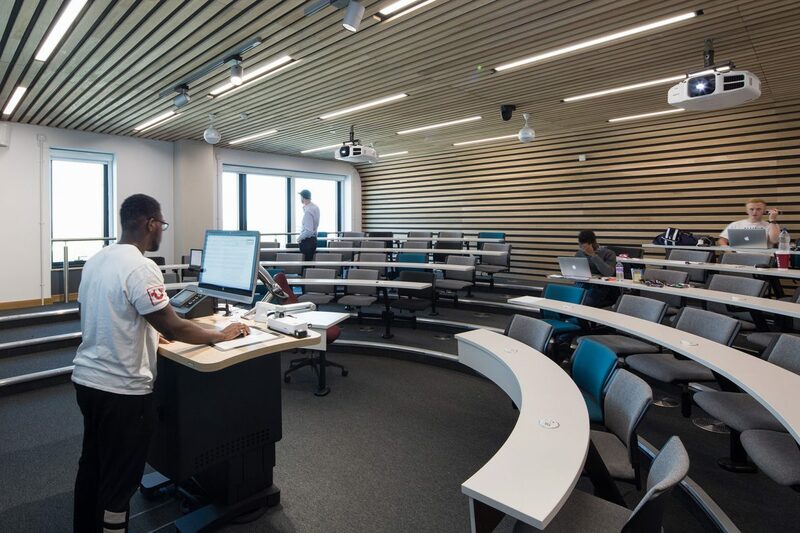 A 300 seat raked lecture theatre is accessed from the ground floor. Routes around the theatre have been carefully developed to provide an entrance at the front of the theatre and an exit at the rear of the facility to help mitigate the impact of the hourly movement of students. 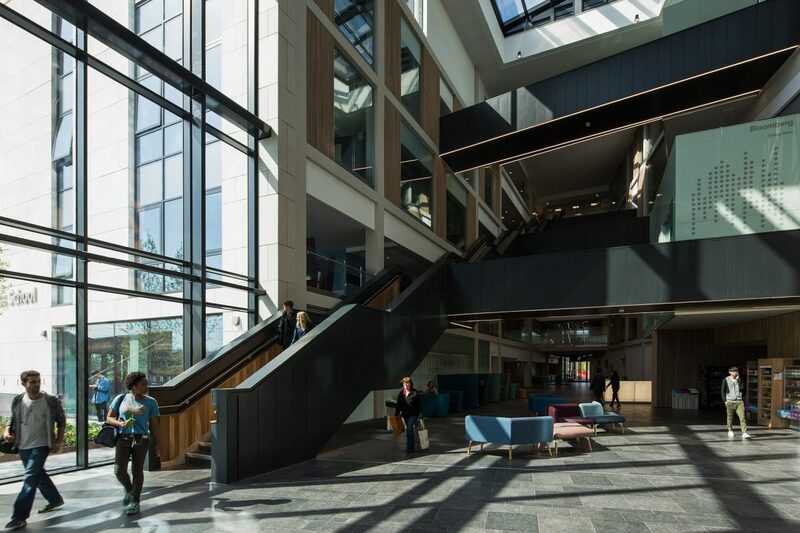 Circulation around the Bristol Business School is obvious and highly visible from the main atrium, with a grand stair case linking the various levels of the building with the main lift zone located adjacent the stair. 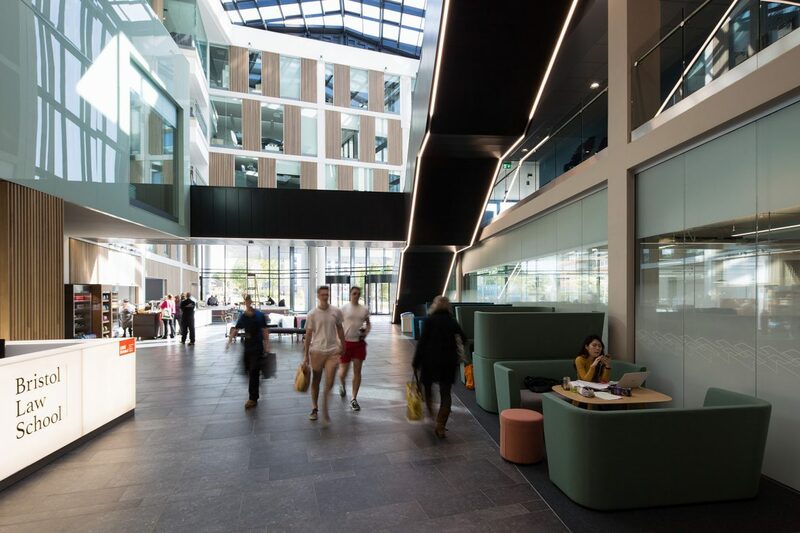 Bridges at every level cross the atrium to provide connections between staff and student zones with breakout meeting and study spaces at every circulation interface on every floor. On the ground floor the space opens up to the ‘Heartzone’ plaza to the south. 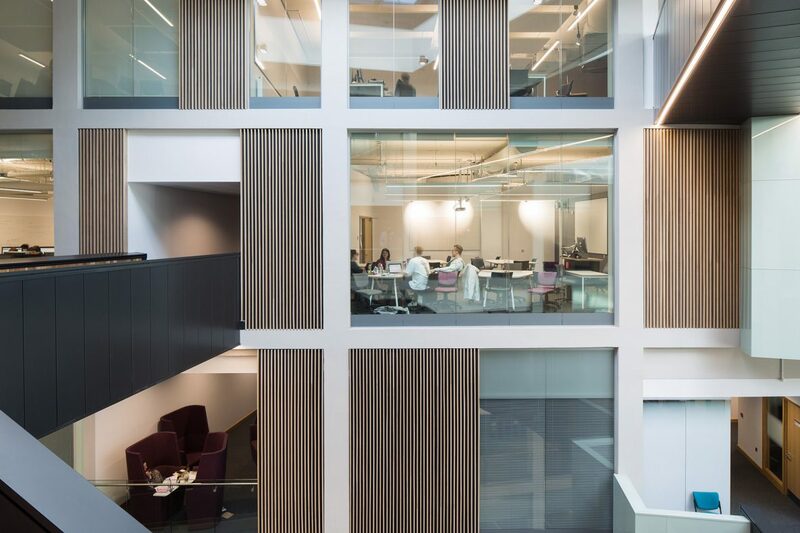 Key active spaces such as the building reception and café (with social learning areas) provide vibrancy to enliven the space. The two wings of accommodation contrast to reflect the accommodation uses within and the orientation of the building on the site for environmental purposes. 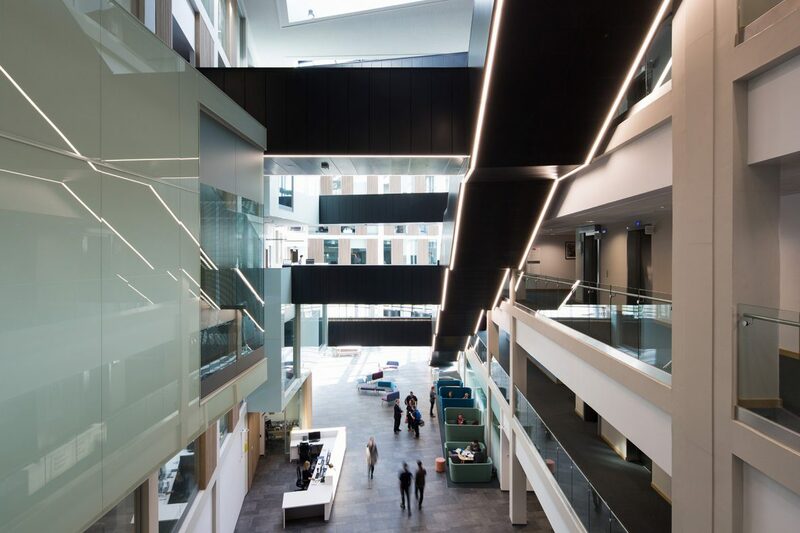 A key concept for the building was to promote collaboration and this developed into a building that encompasses two distinctive wings of accommodation which enclose a central atrium space that forms the heart of the building and incorporates a variety of social learning and flexible meeting spaces. The development involved 300 members of staff across 5 departments with student representatives involved throughout the project. The full time project champion ensured all stakeholders were able to express their views and the University community was able to access a blog that recorded progress and decisions. Taking BIM beyond design and using it for cost effective facilities management of an occupied university estate. 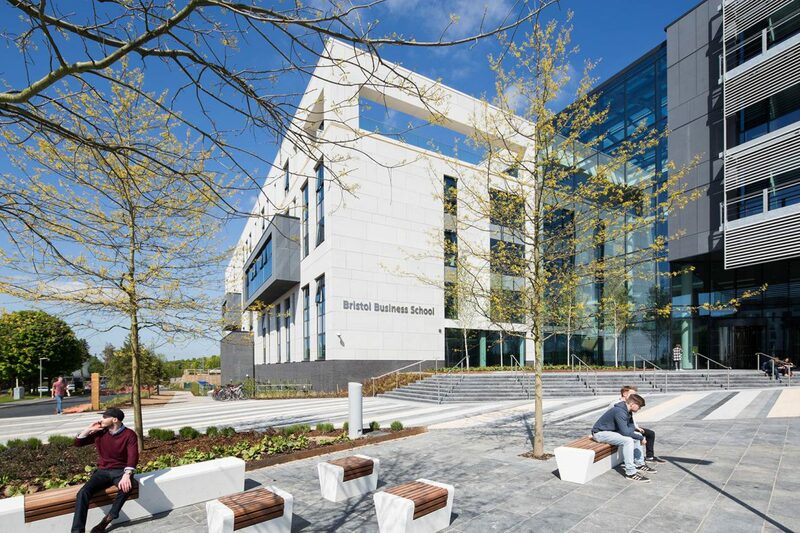 The recently completed Bristol Business School is not just a pretty building. 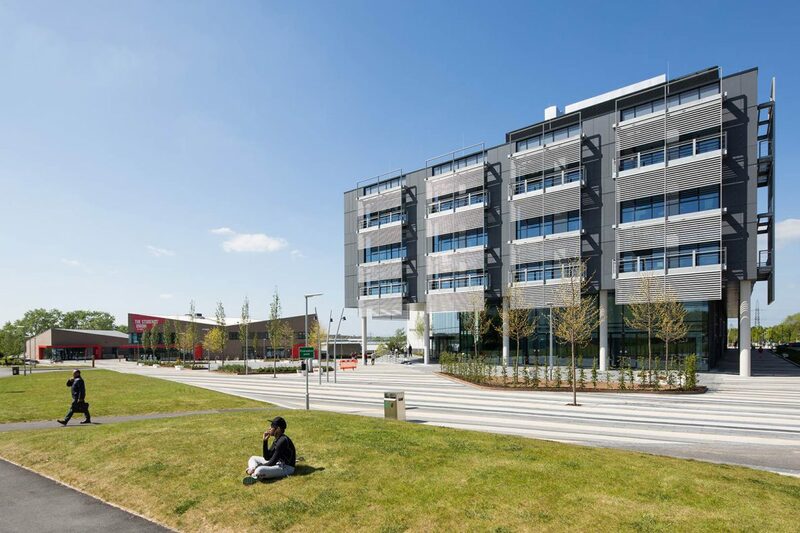 Behind its facade hides a BIM model that we successfully integrated into University of the West of England’s (UWE) computer-aided facilities management system (CAFM) using the COBie data schema. 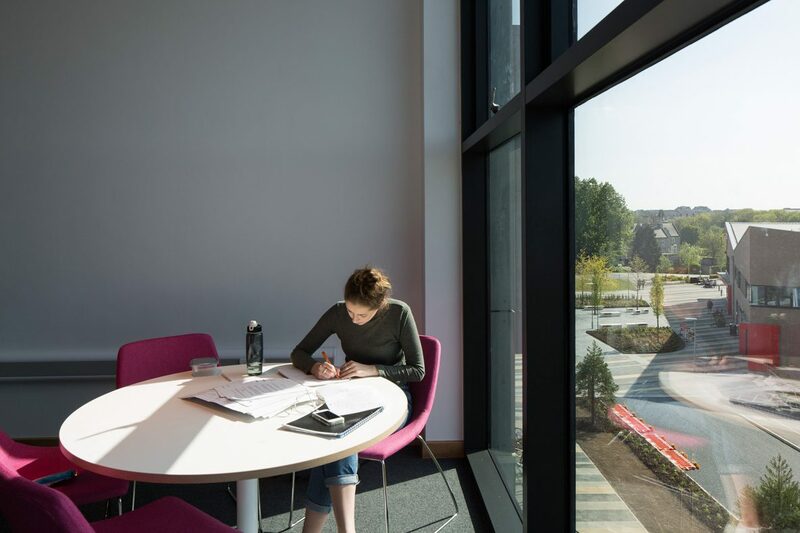 The sophisticated information model is now helping UWE not just to manage and report on its new facility efficiently, but to plan its maintenance more straightforwardly too. For an owner-occupier with an enduring interest in the cost-effective operation of its assets, this looks like a compelling return on investment. UWE is an experienced construction client. With a valuable, burgeoning estate, it is deeply motivated to take a long-term strategic view of its development and agile enough to link capital to operational expenditure. 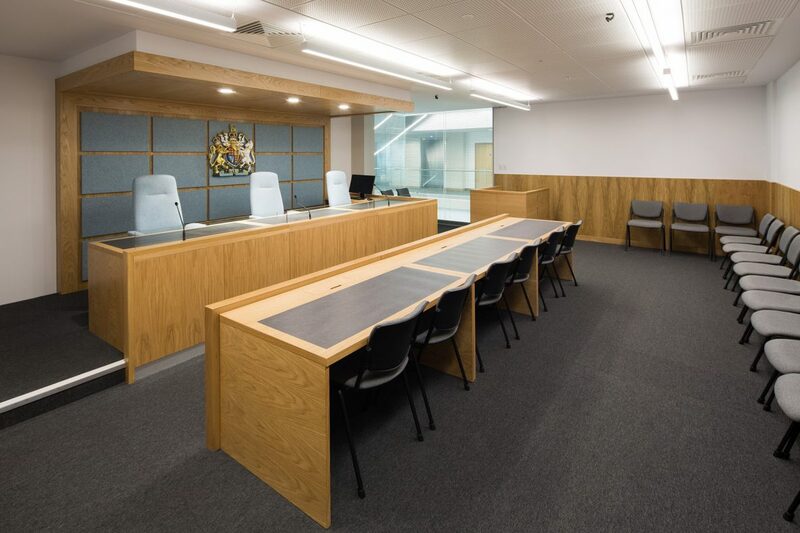 It is no surprise, therefore, that it was prepared to commission Stride Treglown to push the BIM Level 2 model past the post-completion stage and into facilities management (FM) territory. We collaborated closely with UWE to develop their brief from the start. It was important to leaven our understanding of their vision for the future with the day-to-day realities of the estates team’s CAFM information needs. From that we distilled a Custom Data Delivery schedule that prioritised only the most critical information. The brief set, we then collected exhaustive amounts of information from the supply chain with help from the main contractor, ISG, to ensure that there was nothing missing in the model. 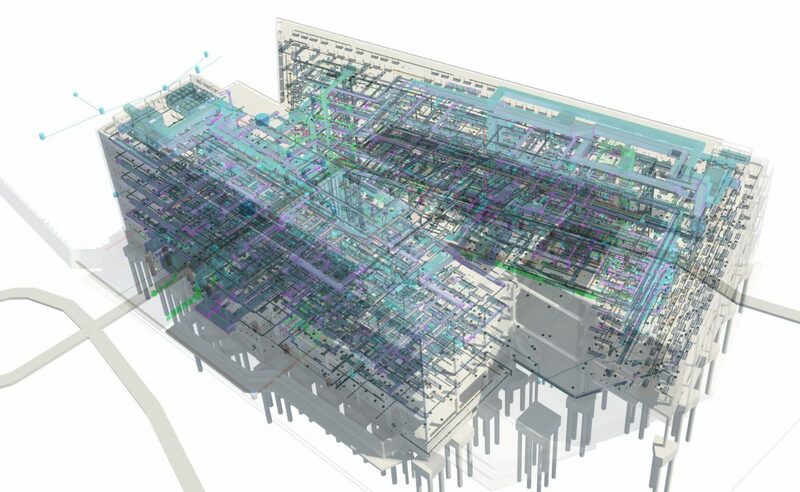 25,000 lines of data later, each object in the BIM model was robustly linked to a system, product, space and zone. Data becomes truly powerful when organised into knowledge. 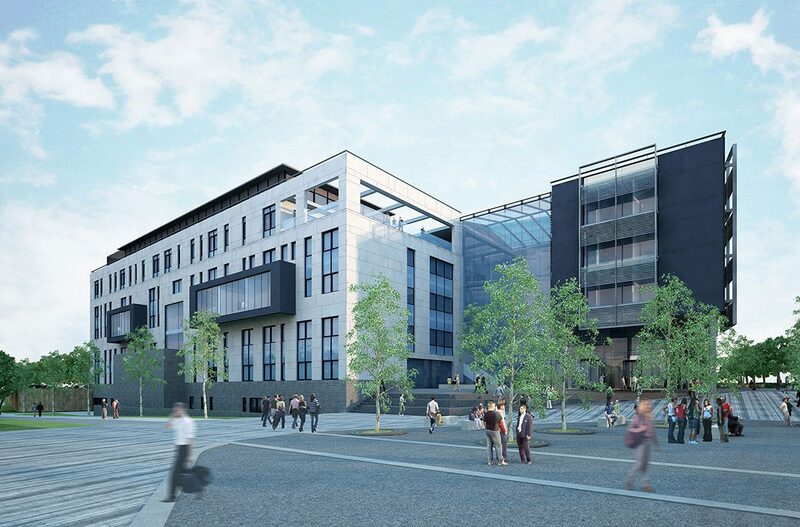 Very unusually for construction projects in the UK, we delivered the Bristol Business School project’s data in the COBie format. Collecting the data and then applying the format took dogged persistence but was the lynchpin to our success in integrating all the data into the UWE’s CAFM. The resulting model gives them instant access to live data from across the estate, making the maintenance and operation of their assets more efficient for their hard-pressed FM team. They can access specific characteristics about each component, such as its SFG20 maintenance codes, condition reports, health and safety ratings, fire ratings, and voltages, totalling a massive 41 lines of data fields per object. All product manufacturer data is also included, putting everything the FM team needs in one place. This radically simplifies and clarifies information management for the duration of the building’s life. The integrated asset model adds value in countless other ways. UWE is able to receive works requests, make statutory inspections, and carry out planned preventative maintenance more effectively, to tighter timescales and budgets. It will also help in any future refurbishments or extensions, all of which can be monitored in the same way. They anticipate saving between 20% and 40% on lifecycle costing. 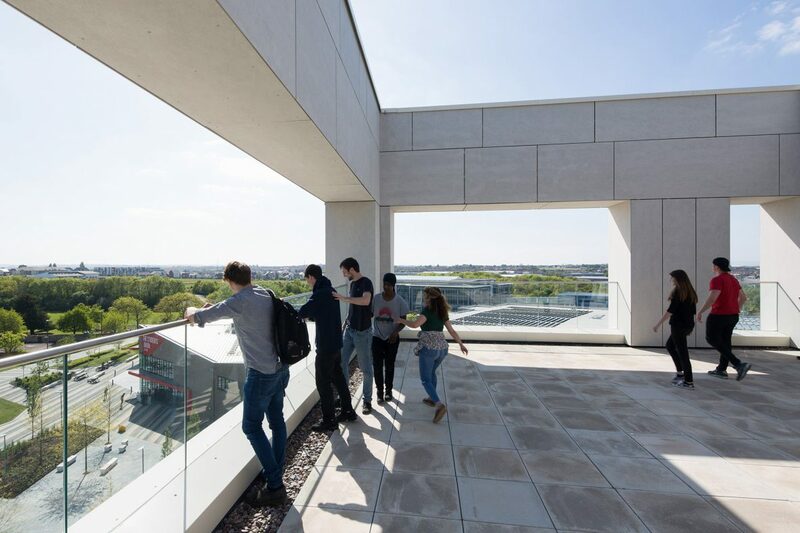 With the UK Government’s ongoing commitment to BIM, this project will put UWE in poll position to reap the Digital Built Britain policy’s considerable potential. 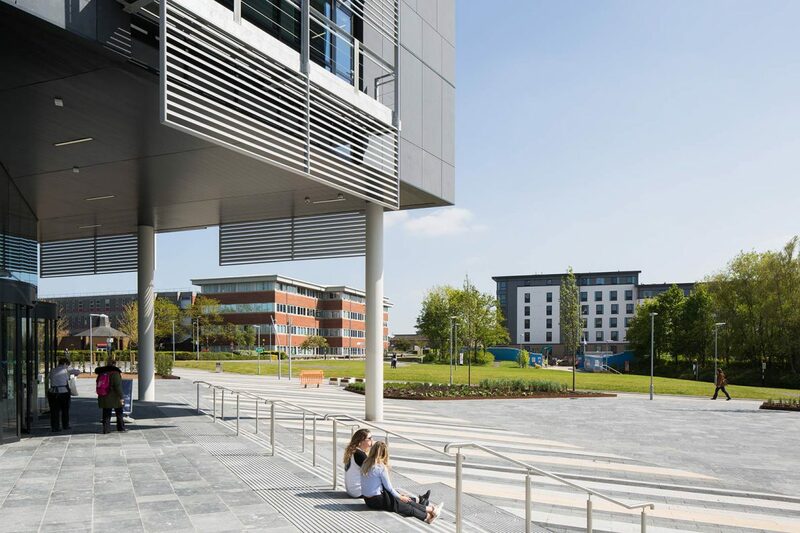 Primarily a hard-landscape scheme, Frenchay Square is a flexible-use space that caters for events, pedestrian circulation and cycle lanes, with seating areas and a grove of semi-mature trees. 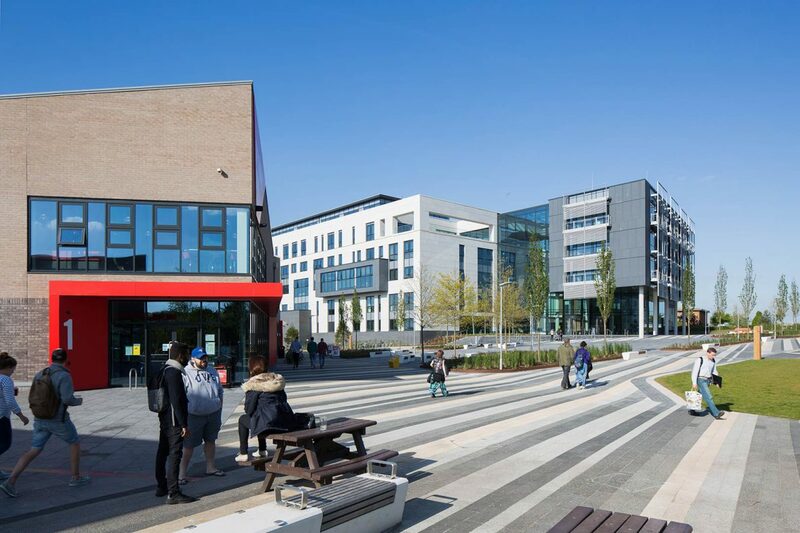 The key concept for Frenchay Square was to unify the existing campus with the Students’ Union building and the Faculty of Business and Law building (Bristol Business School), enhancing the cycle and pedestrian access, whilst creating a new character for the external spaces. Natural stone and high quality concrete setts instil a sense of arrival and inspire civic pride, with the character unified by a consistent design that is reinforced through repeat detailing. 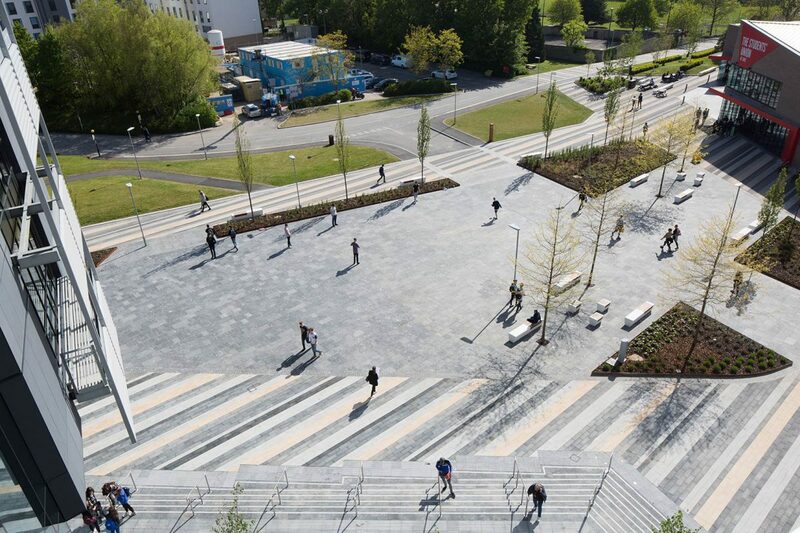 A unique pattern has been arranged to reflect the campus identity, with the campus bar code used as a design feature, with the ‘black & white’ banding providing the inspiration behind the striped paving pattern that has become a defining feature of the works. 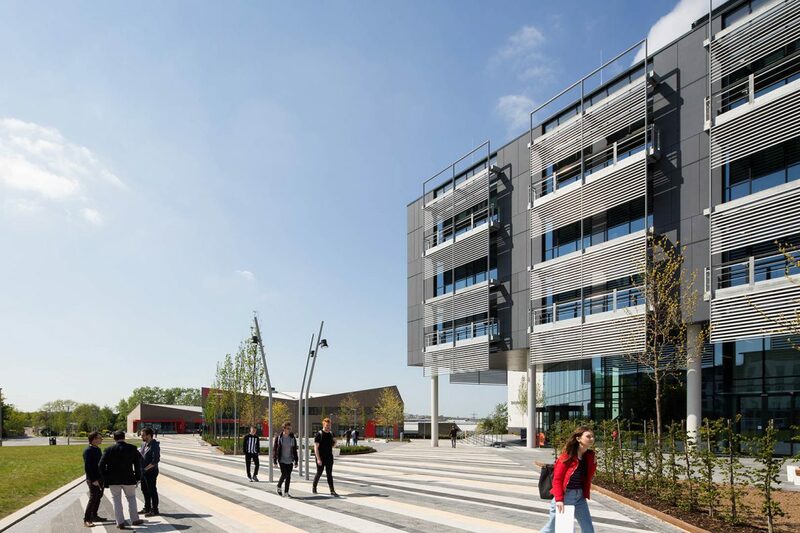 To provide maximum impact throughout the whole academic year, planting design required an emphasis on drought tolerant species and sensitive combinations which complement. With good planting design, maintenance can be reduced, leaving plants to grow to their full size. Substantial tree planting was proposed relating to the scale and size of the development, particularly in areas with sunnier aspect. Ninety semi-mature trees were hand selected at Lorenz von Ehren tree nursey in Germany. They were tagged in September, before being lifted and transported to UWE in December and January. The visit to the nursery allowed for the specific requirements and characteristics of the tree species to be assessed on the functions and uniformity that they were expected to perform in such an important location for the campus. Can Post Occupancy Evaluation be done on Instagram? A very public leap of faith with UWE Bristol, ISG and Godfrey Syrett. 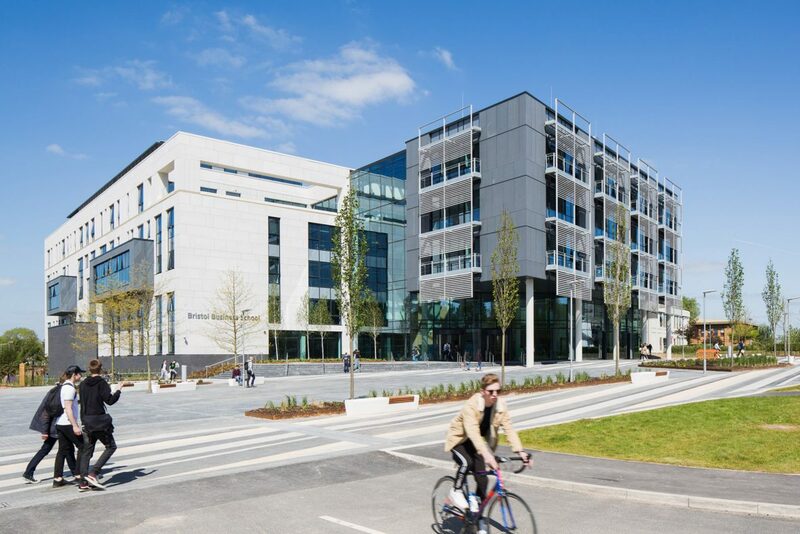 Bristol Business School and Met Office Data Centre both shortlisted for Constructing Excellence awards.